EBP50 antibody recognizes Na(+)/H(+) exchange regulatory cofactor NHE-RF1, also known as NHERF-1, EBP50, sodium-hydrogen exchanger regulatory factor 1 or solute carrier family 9 isoform A3 regulatory factor 1. The antibody has been extensively validated for western blotting using whole cell lysates. 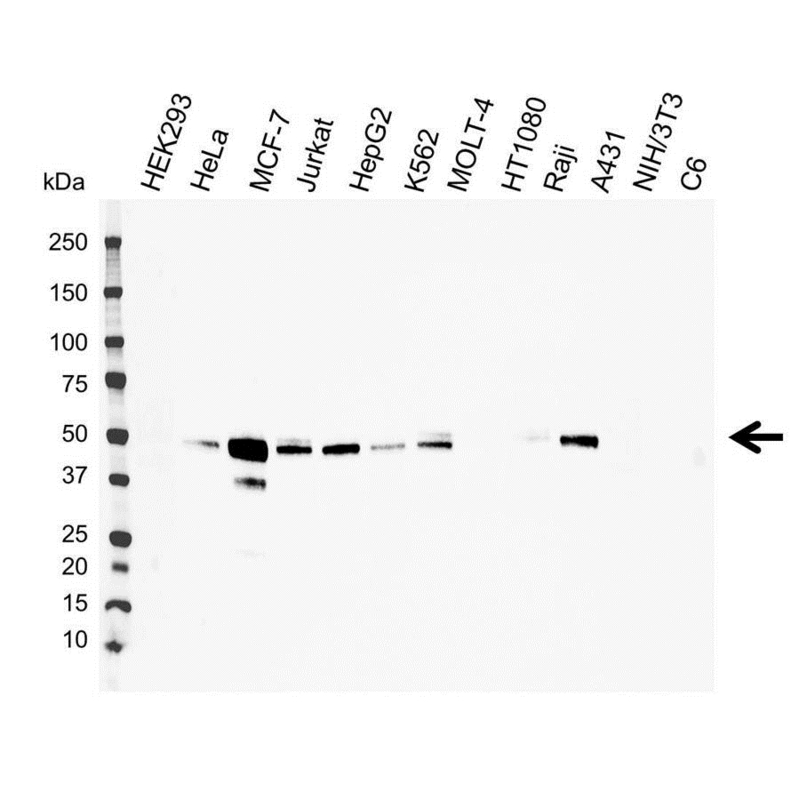 Mouse anti Human EPB50 antibody recognizes ezrin/radixin/moesin (ERM)-binding phosphoprotein of 50 kDa (EBP50) otherwise known as Na+/H+ exchanger regulatory factor 1 (NHERF1), regulatory cofactor of Na(+)/H(+) exchanger, sodium-hydrogen exchanger regulatory factor 1 or solute carrier family 9 isoform A3 regulatory factor 1. EBP50 is a 358 amino acid cytoplasmic adaptor molecule containing two PDZ domains. EBP50 is expressed in tissues containing polarized epithelia, including the small intestine, placenta, liver and kidney. The ERM family of membrane-cytoskeletal linking proteins act to maintain a regulated linkage between actin filaments (F-actin) and the plasma membrane. Studies have revealed that EBP50 is an important ERM binding partner, which interacts with the N-terminal FERM (four point one ERM) domain of ERM proteins, via its C-terminal domain. EBP50 colocalizes with actin and ezrin, in the apical mircovilli of epithelial cells and this role as binding partner has been further shown through the interaction of EBP50 with the transmembrane adaptor protein known as protein associated with glycosphingolipid-enriched microdomains (PAG), in T-cells (Reczek et al. 1997). Mutations in the gene encoding EBP50 leads to nephrolithiasis/osteoporosis, hypophosphatemic, 2 disease, characterized by impaired phosphate metabolism (Courbebaisse et al. 2012). Other ligands which bind to the PDZ domains of EBP50, include beta-catenin, cystic fibrosis transmembrane conductance regulator and the type II Na/Pi cotransporter Npt2, implicating EBP50 in a diverse range of biological systems. Mouse anti Human EBP50 antibody recognizes EBP50 as a single band of ~50 kDa in western blotting in multiple cell line lysates including myeloid, lymphoid, neuronal, adenocarcinoma, sarcoma and embryonic kidney. Anti EBP50 antibody detects a band of approximately 50 kDa in Jurkat cell lysates. Bacterially produced recombinant full length human EBP50.